Did any of you try this? Last edited by SebringSilver; 11-29-2008 at 09:18 PM. DO NOT BUY THIS ONE IT'S FROM HONG KONG. IT DOES NOT WORK with my 8gb SDHC Sandisk memory. Funny, I bought the same adapter from fleabay, and seems to be working with my Kingmax 8GB SDHC card. Hows the sound quality using the cards? Is the maximum card size you can use with that 6-in-1 4GB? I'm wondering why it's even worth it to try and get this 6-in-1 adapter for such a low memory size. You can just burn mp3's onto a DVD for 4.7GB, and it costs the price of a disc. On the other hand, I see someone was able to get a 32GB working through the CF route, which I am considering. Good point about the MP3s on a DVD... Still, you can change up what's on your card pretty easily if you want to. No, the 6-1 limit is 2GB for SD cards if it is the older adapter that does not support SD HC. I've used my Sandisk 6 in 1 adapter for 8 GB SD HC cards (I don't have any bigger), the CF adapter I've used for 16 GB but as you say, others have used 32 GB cards. There are a few restrictions on the number of files and folders and folder levels, I believe the max number of files on a card too but these should not be a problem for 8 to 16 GB cards. The user manual tells the formats Comand accepts (I believe FAT and FAT32). Files have to be MP3 or VMA (some older devices only support MP3). There are some restrictions on the MP3 coding parameters but those should not be an issue in practise. I'm guessing you were using an SD HC card on an adapter that did not support HC cards. Not sure what could be wrong with the memory stick, I don't remember if my adapter even supports that format. As long as the songs are in a compatible format (they play on one card), it should be about the PCMCIA adapter and the card, you can test that on a laptop PCMCIA interface. The rest should be the file structure limits for a huge number of files. I don't have an English-language manual, so I have to use trial and error or use what I learn here. Plus, my wife has an aversion to reading user manuals. But COMAND won't play iTunes files, right? aac, if I'm not mistaken? No, as far as I know it is MP3 and VMA only (I don't think I said it would do AAC). Edited: unfortunately the C-class manual does not cover the head units. 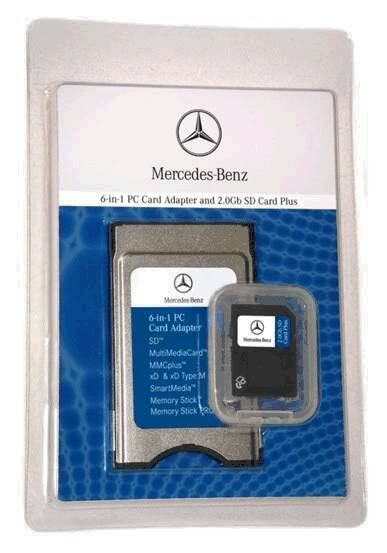 The S-class manual should give mostly compatible info for the memory cards etc. CF works better with pcmcia card. 32GB card from newegg cost about $55 and pcmcia card is $9. About 10GB filled and one folder has 500 files without any problem (512 files per folder max I guess). No delay during folder change with std speed card, Sandisk ultra2 has a little bit quicker access but not noticable. Hey does the pqi card sit flush when placed in the holder? I use a pqi compact flash pcmcia card with a generic 32gb compact flash card, works fine. both bought off ebay. 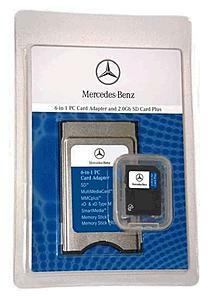 If don't mine me asking how much did you pay for the 32G compact flash card and by chance do you know how much music you can store on the card? I've been looking at a lot of sites, here's one for you to check out. Just got mine today, works perfectly and there's no lag. This is the only PC adapter I found compatible with SDHC. Edit: I'm not sure if it has already been mentioned, but I'll say it again the SDHC cards are not compatible with the Sandisk 6-1 PCMIA adapter. Do you have a pic of the one you got? And one other thing, I just noticed/remembered is the PCMCIA Adapter sits flush in the console, but when the SDHC is inserted it sticks out maybe 1/8th of an inch or something....nothing to cry about I'm just happy i got 13gigs of music on my Console screen finally. I just want to make sure that I get the most compatible device with the most storage space. It is. but not all Sandisk 6-1 PCMCIA. The one that support the SDHC will state it supports SDHC. Its written on it. Some forum members are using it. There are two Sandisk 6-1 PCMCIA card adaptors. One that only support SD and one that support both SD and SDHC.